Add celery and mix well. Add red chilli paste and honey, mix and sauté till the oil separates. Add crushed chicken stock cube, 1 tablespoon spring onion greens, mix and cook for a minute. Add crab meat, mix and cook for 2 minutes. Add ¼ cup water, mix and cook for a minute. Add 1 teaspoon vinegar, salt and cornflour slurry and mix well. Add 1 tablespoon spring onion greens and mix well. Add crushed peppercorns and remaining vinegar mix. Remove from heat and set aside. Arrange crab shell and claws on a serving plate. 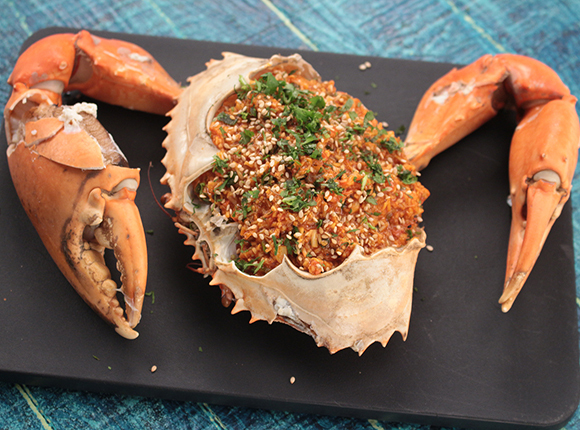 Put the cooked crab meat mixture in the shell, garnish with sesame seeds and coriander leaves and serve immediately.